In a previous blog post I drafted Jadevon Clowney as my number one pick, yet if I’m the Texans GM I still need a QB. In theory the Texans on Offence have all the weapons in place apart from a QB who can light it up. When Matt Schaub has 10 TD’s and 14 interceptions and a passer rating of 73 you know its not good. (For comparison Dolphins QB Ryan Tannehill had 24 TD’s and 17 INT’s passer rating 81.7) For that matter Schaub had one of the higher rush averages as well with 4.8 yds a carry. Worryingly Case Keenum the back up QB had the highest rushing average with 5.1 yrds so may be they need to look at drafting better Offensive Linemen. But I digress. Again with my Texan GM hat on, I am going to guess the strategy is to find a QB diamond in the rough in the later rounds and this is were I think Aaron Murray comes to the fore. 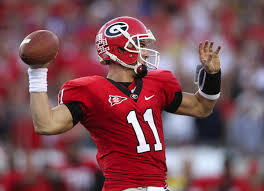 The SEC all time leader in Passing Touchdowns and Passing Yards, a four year starter for the Dawgs and also saw off Zach Menttenberger who you will probably know better as the LSU starting QB in 2013.The volume of work that Mr Murray has put in is very impressive and my only question would be why did his passing yards drop in 2013 and his rushing yards increase? There may be a obvious answer caused by the cyclical nature of college football. If Mr Murray hadn’t torn the ACL in his left knee in November 2013 I think he would be among the first QB’s taken – but as did he could be just the man for the Texans. Previous Previous post: NFL Draft: DE or QB as the number 1 pick?